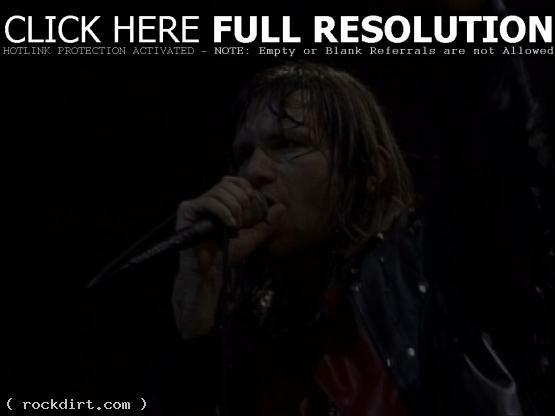 KNAC.com recently spoke with Iron Maiden frontman Bruce Dickinson who recalled the worst moment he had with the band at a show in Mannheim, Germany, where Janick Gers suffered a near fatal fall. Dickinson said, “He stepped off and fell off. I just saw the guitar gone and him and it was awful! I’ll never forget. I mean, I thought he was nearly fu**ing dead. I really did, because I saw how far he had fallen. He was unconscious. He was covered in blood and his whole head was covered in blood. And there were iron railings and posts. I was really freaked out. And he was so lucky. He actually fell onto a security guard, and that stopped him. And he headbutted an iron post. That’s what cut his eye. He was so fu**ing lucky. He was lucky he was thick [laughs out loud]! That thick fu**ing head! Sh**! I tell you, I couldn’t… [hesitates] I mean, I did my singing bit … I couldn’t stay on stage. I was like, what did the ambulance guy say… And then as soon as I heard he was up, he was sitting up talking, you know… He didn’t know what he was saying. Apparently, when they put him into the ambulance, his guitar roadie went to the hospital with him, he suddenly sat up and went: ‘Who’s playing my guitar solo? '” Read more.